Protein skimming, also known as foam fractionation or adsorptive foam seperation, is a process where air bubbles drive organic compounds out of a water solution. 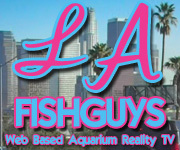 The advantages to a hobbyist are increased oxygenation and the removal of nitogenous compounds. The technical process is one where complex organic molecule compounds, which have oppossing hydrophilic and a hydrophobic ends, orientate themselves accordingly between the air and water surface. The hydrophilic end extends towards the water and the hydrophobic end towards the air. These compounds, called surfactants, are strongly attracted to the water surface and they form a 'skin', such as the organic scum you see at the waters surface. This same organic layer can coat an air bubble as it rises within the water column. Once this bubble reaches the surface the skin that surrounded it creates a froth. This froth is a mixture of proteins, enzyemes, fatty acids, amino acids, and many other organic compounds. It is these compounds that we wish to eliminate from the water. By doing so we can decrease the amount of organic substances that the biological filter will be required to convert thus reducing its load and, ultimately, the amount of nitrates produced. Depending on the amount of water contained within the foam will determine how wet or dry the foam is. This is where design and adjustment come into play. The three main factors involved in a proein skimmer are; bubble size, air/water flow, and contact time. Bubble size. If the bubbles are too small they tend to not rise fast enough, thus not effectively carrying organics to the surface. Too big a bubble and it will not come in contact with the water long enough. Additionally it could be too distruptive to the foam level that has collected at the surface. 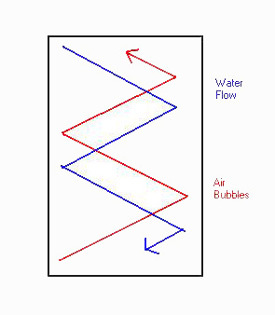 Air / water flow. Should the amount of air bubbles exceed the water water flow rate the result could be too many bubbles exiting the skimmer unit and ultimately being drawn up by the water pump and discharged into the aquarium. Too strong a water flow rate and the air bubble do not come in contact with the water long enough for organics to adhere to them. Contact time. 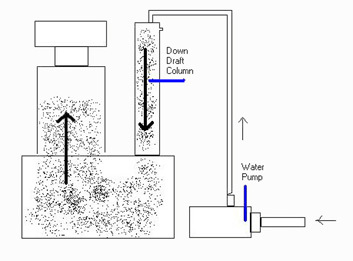 Water and air flow direction are the two factors that influence a protein skimmer significantly. By altering the direction that the air and water pass each other one can increase the amount of contact time between the two. If the water and air bubbles flow in opposite directions, counter current, the contact time and effectiveness is increased. Seperate air and water pumps are used to introduce each into this design. The water enters from the top left side and exits, via a pick up tube, from the bottom left side. The air, introduced at the bottom of the skimmer, is routed via an air pump and air line, to a air diffusser. 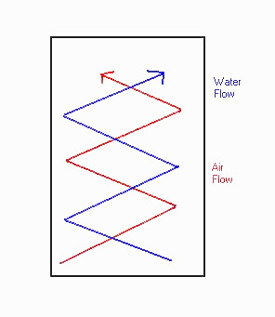 Air and water are introduced at the same point in this design. 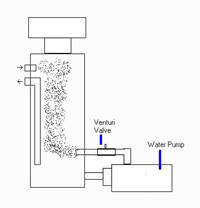 As water enters the skimmer at the top left it incorporates a Venturi valve. This valve draws in air as water passes through it. 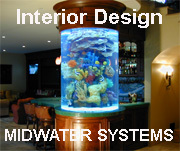 Seperate pumps are used to introduce water and air into this design. The water enters from the top left side and exits, via a pick up tube, from the bottom left side. 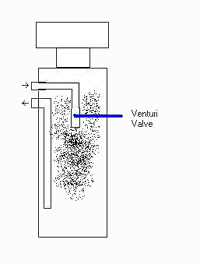 The air, introduced at the bottom of the skimmer, is generated via a water pump driven venturi valve. Downdraft skimmers are a new trend in skimming. Water is discharged under high pressure down a column. At the same time air is drawn in, via a venturi effect, at the top of the column. 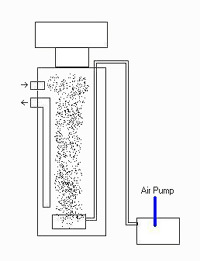 The combination of high pressue water and air becomes explosive as it is driven down over bio-balls. The result is organics that are 'beaten' from the water. Which is the better protein skimmer ? That all depends on your application, what you can afford, and the livestock that you are holding in your tank. The bottom line, a skimmer is a good choice to add to your tank as it will help in many ways.